Batman versus Lord of the Rings? **** that's a hard decision. In the end, Clooney ****ed the franchise yet again. I just cannot get over that streak of pure garbage in the middle. The Hobbit movies weren't great, but they'll movies I can watch and enjoy the cinematography if nothing else. But man, Batman & Robin deserves genuine consideration as one of the worst movies ever made. Batman Forever was pretty awful as well. Now what could flip it is if you consider the animated films as part of the franchise. Some of those are genuinely good. But in the end there are a dozen of the damn things and it just didn't seem fair to include them. So I went LOTR because of how god-awful B&R was. 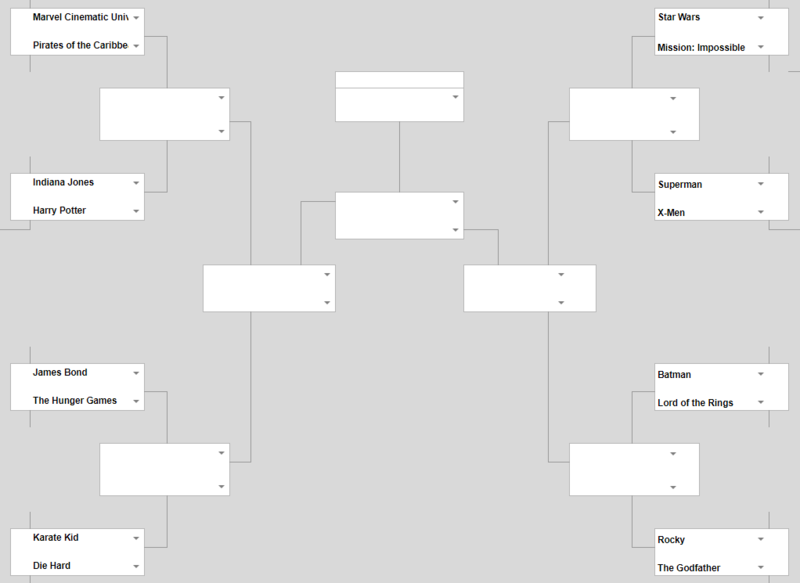 Granted its competition this round is Karate Kid, but Die Hard seems to be the Cinderella story of the tournament. At 13-0 so far, it's basically a lock to make it to the Elite 8. It's got its work cut out against Bond (probably) though. I know, I know, M:I over Star Wars?!?!?! Hear me out; the M:I franchise has been more consistent in quality than Star Wars. Put down the torches and pitchforks for just a moment. Look beyond the initial trilogy, does anyone consider the prequels good? Is anyone on this board ready to fire up some The Phantom Menace or watch the pillar of charisma Hayden Christensen? Or how about the total bomb that was SW:8 The Last Jedi? Anyone clamoring to pop that gem into the DVD player? I know it will lose but the M:I franchise is strong in my opinion than SW is overall. I'm including the animated movies for both. I voted for Batman but I would be happy with either one. How is x-men not marvel comics? Because they aren't part of the Marvel Universe movies. They were considered Fox. For the love of God, do we have a bunch of 13 year olds on this board??? In no way, shape, or form, should Harry Potter be this close to the iconic Henry (indiana) Jones! Die Hard is really living up to its name. All of my hopes for the tournament at this point are pinned on Indy. I could live with Star Wars as well, based purely on the first three movies, but Indy is where I'm planting my flag from here on out. People don't like to admit it, but Star Wars is a kids story as well. Just because something is meant to be accessible for kids doesn't mean that it can't be well done and enjoyable for adults as well.